Built in 1939, this Gimghoul classic center hall colonial was completely renovated and expanded in an AIA Triangle-Award winning project in 2005. This project added a 2,200-square foot, three-story addition, which includes a main-level bedroom suite, den and family room along with an additional upstairs bedroom suite connected by a light-filled sky bridge. The airy and bright main level features multiple communal spaces and hardwood floors throughout. Enjoy the Gimghoul scene from the glass- walled sunporch or the rear play yard from the large screened porch with deck. A daylight office and exercise room are located on the lower level. There are three additional guest rooms upstairs, one en-suite and two with a shared bathroom. 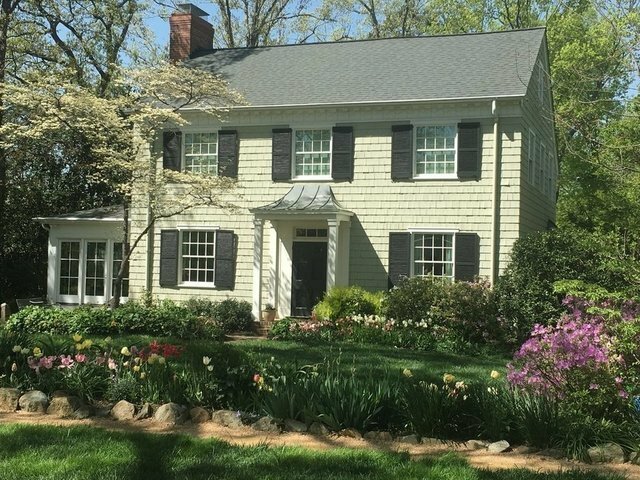 Located in the Chapel Hill School District, this home is a must-see for buyers searching for an ideal downtown location in Historic Gimghoul.